In this week’s Throwback we wind back the clock 26 years to 1993 and Laguna Seca Raceway in Monterey, California. In September of that year the scenic hillside track hosted the United States Grand Prix and it was John Kocinski stunning the crowd of 50,000 by racing his factory Cagiva V593 to victory. It marked only the second ever GP victory for Cagiva, the first in the dry. That made Cagiva team manager and GP legend Giacomo Agostini very happy as well and here he celebrates with Kocinski on the podium. There was a shadow over that weekend’s race, since just a week earlier at Misano, Wayne Rainey had been seriously injured in a crash that ended his motorcycle racing career. 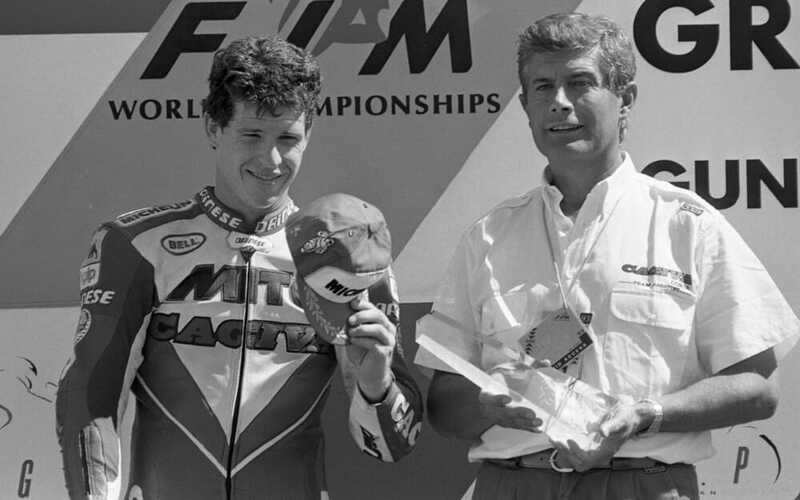 Kocinski dedicated his victory at Laguna to Rainey.